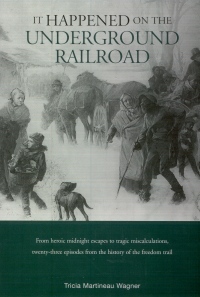 CM Magazine:It Happened on the Underground Railroad. It Happened on the Underground Railroad. Guilford, CT: Globe Pequot Press, 2007. Arnold Gragston began making three to four trips a month across the Ohio River, rowing under moonless night skies. Sometimes he carried just a few people; other times his boat was full. Instead of gaining his own freedom, he helped others attain theirs. Over a four-year period, he helped liberate close to three hundred slaves, and never did he ask for anything in return. In 1863 after rowing twelve fugitives across the river, Arnold was nearly apprehended. To avoid being caught, he hid out for weeks, sleeping in fields and in the woods. He was married by this time, and when an opportunity finally presented itself, he took his wife Sallie as his last passenger across the Ohio River. It seemed like he was pulling the weight of the world in the boat that night, rowing them toward the familiar light on the bank. The Underground Railroad was a means by which escaped slaves in the United States gained their freedom, often ending up in Canada. It was not a railroad at all but a series of safe houses where friendly people opposed to slavery hid the escapees and helped them progress along the route. Because rewards were often offered for the slaves' capture and return, assisting the escapees could be very dangerous. If caught, the slaves were often brutally treated. It Happened on the Underground Railroad tells some of the heroic tales of the escaped slaves and the risks taken by the good people who helped them. It is an example of creative nonfiction. Since details about how many of the slaves escaped are often vague, the author fills in the gaps with guesswork. This works well because the stories are believable. It Happened on the Underground Railroad has 23 chapters which vary in length from four to six pages each. Each tells the tale of one slave, or family of slaves, and the courageous people who aided them. A number are quite remarkable. One of the strangest is that of Henry Brown. Brown had himself nailed shut inside a box and mailed from Richmond, Virginia, to Philadelphia, Pennsylvania. During this journey, the box was very roughly treated, and Brown could easily have died. That he agreed to try and escape in this fashion shows how desperate he was. Prices are given for the sale of slaves. The amounts will mean nothing to readers. In the twenty first century, $1,000 sounds like a small amount, but in the 1850's it was a huge sum. A rough estimate of what $1.00 could buy at the time these stories took place would make them more meaningful. The book has an index, a useful bibliography of secondary sources and a map of selected escape routes. The map is too small and vague to be of much use. A special feature, Underground Railroad Facts and Trivia, is interesting and informative. Examples include "More than four million slaves were set free when the Civil War ended in 1865" and "Twelve American presidents owned slaves, and eight of them owned slaves while serving as president." It Happened on the Underground Railroad is probably best suited to recreational reading though it does raise some serious issues about democracy in the United States when the Declaration of Independence states that "all men are created equal." Anyone interested in the current state of American politics will find the book valuable. Tricia Martineau Wagner, author of this interesting book, has written two similar books, It Happened on the Oregon Trail and African American Women of the Old West. Prior to taking up writing, she was an elementary school teacher and reading specialist.